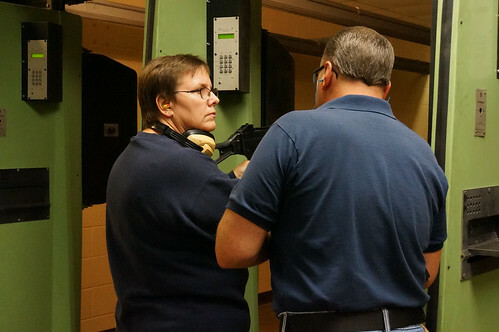 Week 7 was all about classroom preparation for Week 8 at the shooting range. Week 8 was a 3 part night. We got to take a tour of the Speedway Police Department, Meet and Greet Officer Mat Turpin and K9 Tom and hands on shooting in the downstairs shooting range. Special thanks to Jennifer Bremer for taking photos and videos of us and keeping us in line between events. Shooting and training- Thank you to Lieutenant Dan Eacret, Officer Chuck Ezell and Sergeant Rodney Ferguson for your patience and instruction. They taught us the proper stance, hand position and sighting, then it was on to ear and eye protection. Each student was given the opportunity to shoot 10 rounds from a Glock 22. We each had the opportunity to keep our target. Mine wasn’t as bad as it could have been considering I have never shot at an actual target before. 3 rounds were inside the 9 ring, 5 inside the 8 ring, one in the 7 ring and the other just outside the 7. I think I took out his bellybutton with that one. It was a blast, other than Chuck had to keep reminding me to move my thumb unless I wanted the slide to take it off. Thanks Chuck, I would have to shake hands with a limp if it weren’t for you. After we shot the handgun we each had the chance to shoot an AR-15 automatic rifle. Wow, how cool was that. When you have it in semi auto you pull off 1 round at a time, then with a click of the switch you are in full automatic. Pull the trigger and it will empty a whole magazine in no time. So after a couple single shots, we moved to full automatic to show us that after several shots you start to waver in where the shots land. This shows that you really don’t need a full automatic rifle that you would actually be more accurate to just keep pulling the trigger. But……….I gotta say, it sure is fun to listen to. 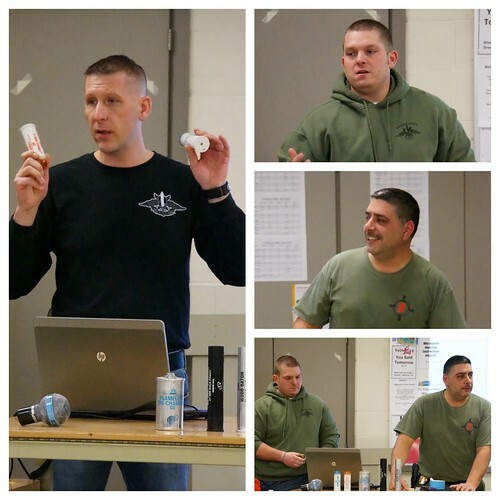 Last week we learned about the amount of training officers and instructors have to go through. 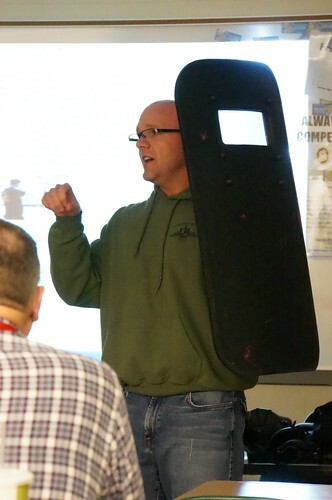 It was very interesting to learn the training that goes into being a well-armed officer. It was so cool to hear about the different types of courses they have to participate in to get their grading. They do static (targets, no moving) and dynamic (tracking, moving targets) courses. The higher you grade the higher you rank. There are marksman, sharpshooter, or expert rankings. They talked about the handguns, shotguns and rifles that they use or have used in the past and the history of these guns. We also learned about the different types of ammo and targets that are used. 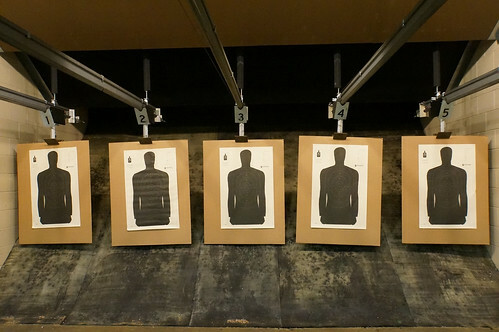 When they use the indoor range, they use a frangible lead-free ammo. We were taught that the SPD indoor range was built in 1972 and then updated in 2006. It was really cool to see what they use as a background, the ceiling design and the fan and air filtering system. They told us about other ranges that they use outside of Speedway. Building Tour- Thank you to Sarah Edie for showing us around the station. We saw the different offices, locked records area, interview rooms, squad room, holding areas, and storage areas. It was really nice to see dispatch and how hard these folks work. The amount of multi-tasking they are required to do is amazing. Thank you to the 2 ladies working that night. Hope we didn’t disrupt your work too bad. Thanks Sarah for showing us around, SQUIRREL, sorry I got distracted for a minute. Okay on to Officer Turpin and Tom. K9- K9 wasn’t my most favorite of the night (I still have a rush thinking about shooting) but those of you who know me, know how much I love dogs. I watch Cops just to see the dogs, and Dave laughs because I keep yelling at the TV to send in the dog!!!! Tom is a beautiful Belgian Malinois/German Shepherd. He came from The Czech Republic, so trying to talk to him with his accent wasn’t easy. Officer Mat Turpin is a hoot, he has a great sense of humor. He talked about all the different skills that Tom has. He showed us Tom’s vest and told the story of how they got picked to receive one. What people don’t realize is that all of Tom’s needs and equipment is purchased with DONATIONS. Everyone should step up and donate to his care and safety. Officer Mat and Tom do a lot for this town and I don’t think people realize that. He can do everything from hunting drugs, taking down bad guys, and can even help locate if the need arises. They may work a set shift, but believe me if they are needed outside that shift, they would be there. We got to see a demonstration of his hunting down a bad guy and doing a bite. But after that we got to visit with a dog, not an officer. He is such a sweet guy, he LOVES his ball and wanted to make sure we saw it. He went from person to person for lots of love. Then it was back to the car and back to work mode. Thank you Officer Mat, Tom and Officer Ryan Hockemeyer who volunteered to be the bad guy. In finishing this week’s blog I’d like to say, sign up for the next class, you won’t regret it. 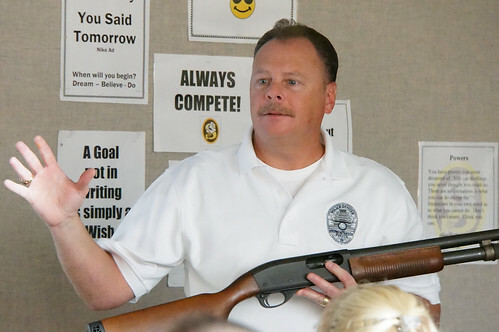 Every citizen in this town should take this class, you will come away with a whole new respect for the awesome men and women of our police force. I’m not just talking about the officers, I’m talking office staff, dispatchers and officers. I feel like not only am I learning a lot, I am also gaining friends. Next, please consider making a donation to Officer Tom’s care and safety. For more videos, check out our You Tube channel. Below is a slideshow of class photos. If you are on an iOS device and cannot view the slideshow, click here. Wednesday marked the halfway point for the current Speedway Police Citizens Academy class. 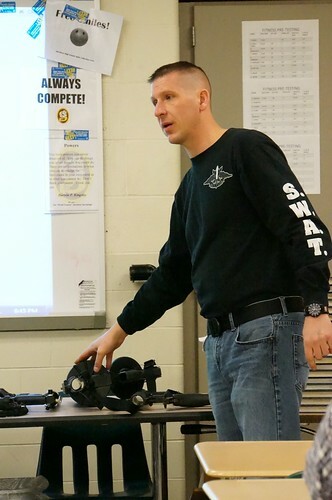 For the first part of tonight’s class, students learned about the Speedway Police Department SWAT team from several members, including Sgt. Robert Dine, Det. Chris Ristuccia, Officer Matt Dahlke, Sgt. Mike Hart, Officer Nathan Shipley, Officer Ben Rupenthal, and Officer Pat Hammel. The SWAT (Special Weapons and Tactics) team is trained to perform high-risk operations that fall outside the abilities of regular officers. Duties include hostage rescues, counter terrorism operations, serving high risk arrest and search warrants, subduing barricaded subjects, and engaging in heavily armed criminals. They discussed the requirements and process that officers must go through to become eligible to be on the SWAT team, as well as the continuing training sessions they take part in, including firearms, building entries & searches, active shooter, and officer down rescue. 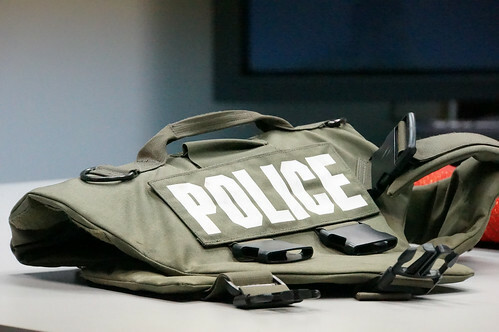 They displayed many of the specialized equipment used by the team, including firearms, submachine guns and assault rifles, stun grenades and riot control agents as well as body armor, ballistic shields, entry tools, optics, etc. 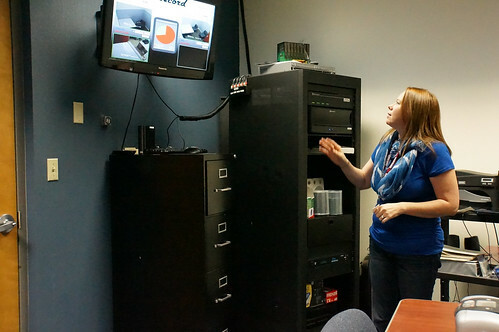 They discussed with students how they assess various situations and intel regarding the physical environment, people involved, etc. to determine how to best respond to and resolve an active situation. 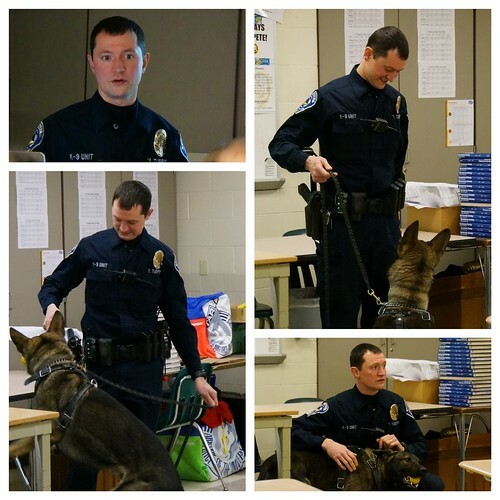 During the next part of the class, Officer Mat Turpin taught students about the police department’s K-9 Unit. 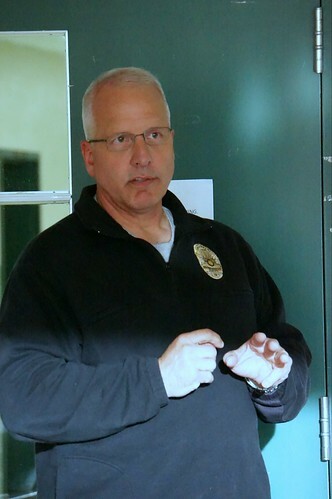 He started with a history of work dogs, focusing on law enforcement, detailing which breeds are typically utilized, including German shepherd, Belgian malinois, Dutch Labrador, Blood hound and Collies. Each breed is used for various purposes depending upon the dog’s characteristics. Strong positive characteristics are ball drive, hunt drive, prey drive and food. Negative characteristics are environmental (dogs that don’t like to be in certain situations or even like certain texture floors, etc. 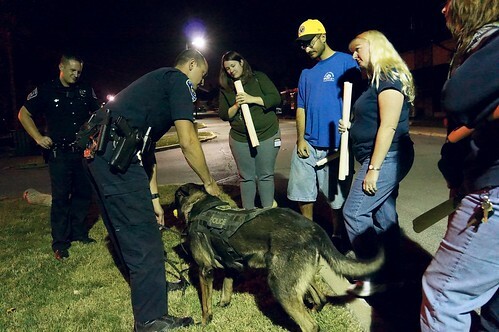 ), too social, lacking in drive, or sound issues (dogs must be able to deal with gunfire). Officer Turpin then brought in K9 Officer Tom to meet the class, but he was far more interested in chewing on his plastic toy ball than he was with us! Next week, Citizens Academy students will be learning about crime scene investigations and the following week will have a chance to try out their new skills in a simulated crime scene! Stay tuned! !